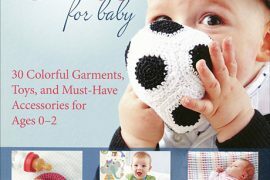 Lindsey of Poetry in Yarn recently sent me a copy of her new pattern booklet to check out and I wanted to share it with you here today. Lindsey said we could do one better than just a review so one lucky winner is going to get their own PDF download of the booklet. “Lindsey Stephens is a crochet designer and Professional Member of the Crochet Guild of America (CGOA) as well as a member of The National Needlearts Association (TNNA). She has had her designs published in a national magazine as well as by yarn companies, and has taught needle arts and crafting classes in a variety of venues. Lindsey learned to crochet while on a three day road trip when her family relocated from her home state of Texas to Connecticut. When she first arrived in Connecticut, Lindsey owned 2 skeins of yarn. She has been steadily adding to her stash ever since. Poetry in Yarn is the result of Lindsey’s love of expression and experimentation in fiber arts and her desire to share her discoveries with others. I love the way that she describes that – how she creates pattern so share her “love of expression and experimentation in fiber arts” with others. What a great way to describe what a crochet designer does! 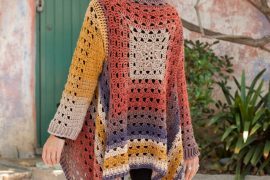 Lindsey offers regular crochet patterns as well as Tunisian crochet patterns and she also has patterns for knitters. 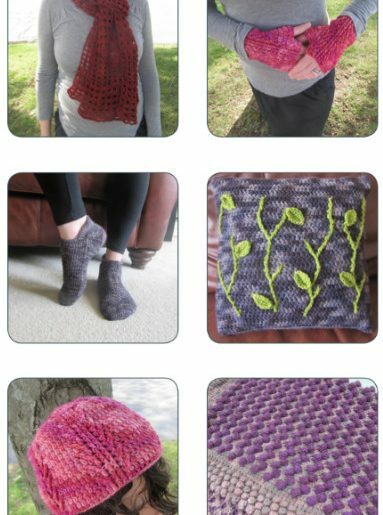 Her patterns are sold through her own website as well as through Ravelry. Lindsey’s new crochet pattern booklet is called At the Bakery and subtitled: 6 Crocheted Designs Inspired by Pie. What a great fun idea for a compilation of projects around a favorite food for the holidays. And indeed, the patterns in the book would make great holiday gifts to put under the tree this year although they would also work all year round. A crochet scarf inspired by sugar and candy. Lindsey says that there is a bit of a wavy edge to this pattern “just like a classic candy wrapper”. A crochet blanket inspired by blackberry pie. I love the textured stitches worked up with a large size hook on this one! A crochet hat and matching fingerless gloves inspired by cinnamon sticks. What a great inspiration but the color choice will surprise you! Lindsey is anything but predictable. A crochet pillow with great intarsia post stitch vines. At first I wondered what vines had to do with pie. I was thinking perhaps that pie shops often have flowers or gardens associated with them. But then Lindsey explains that this piece was inspired “by leaf designs often seen on pie crusts. Low-rise crochet socks “inspired by the vents made in the tops of baking pies”. Creative! Crochet socks are hot right now – have you made any yet? Each pattern includes photos, a description, a diagram, row-by-row instructions, materials information and notes to help you complete the piece. 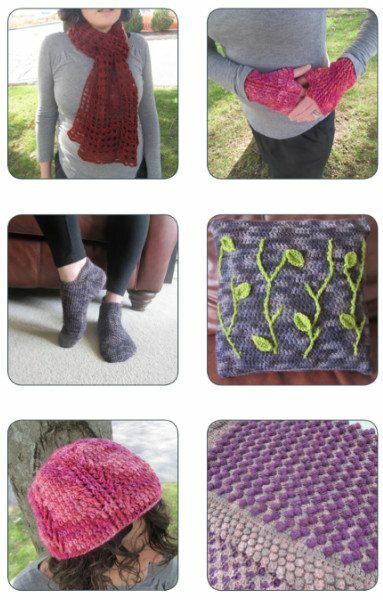 This crochet pattern booklet is available for download as a whole book but it is also possible to purchase just the individual patterns from Lindsey as well. They are available on Ravelry. 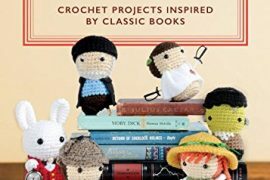 What is your favorite kind of pie and what item would you crochet inspired by your choice? Like Crochet Concupiscence on Facebook. Additional options: My author page and my book’s page. Like Poetry in Yarn on Facebook. Follow Crochet Concupiscence on G+. Join the Crochet Saved My Life Ravelry Group. Add Lindsey as a favorite designer on Ravelry. Add any of the pictures in the post to Pinterest. Your Pin should link back to this post. Tweet this giveaway. Include a link to this post and a shoutout to @poetryinyarn and @crochetblogger. Follow the Poetry in Yarn blog. Here’s the link to her feed. Sign up for the Crochet Concupiscence email newsletter. This giveaway will be open until Monday November 26th at noon PST. Entries open to anyone and the winner will be selected at random. Entries that do not include a link back showing that the entry was completed will be disqualified. Entries that don’t answer the giveaway question will be disqualified. Ooh, ooh, pick me! I love the look of the blackberry pie blanket. Ok, to answer your question, my favorite type of pie to eat is probably cheesecake (I know, it’s called a cake, but I think it really qualifies as a pie since it has a crust). My favoriet type of pie to make is probably apple pie with cherry pie coming in a close second. I already like your FB page, and I just liked the Crochet Saved My Life and Poetry in Yarn pages. I’m already following you on Pinterest and I started following two of Lindsay’s boards. I’m already a member of your group on Rav. And, I’m tweeting about the giveaway and pinning. Thanks for the giveaway! My favourite kind of pie is chocolate cream. If I could design something based off of that, it would have to be a cowl in deep textural browns with flecks of golden brown thrown in (for the crust). but if it doesn’t my username on Ravelry is Kobuu. I’m in both groups. I already follow both of you on G+. No real way to show that unless you search for me in your circles. You’ll see me. I’ve also subscribed to the feed in Google Reader and I just signed up for the newsletter. Again, not sure how to show you that I did that but I sure you got a notification for my addition to the mailing list. I don’t have facebook anymore. By my count that should be 10 additional entries! Really excited for this opportunity! Those patterns look DELICIOUS!! My favourite pie is steak pie, Think I would crochet a nice afghan blanket in different shades of brown, finished with a shell edging for the crust. I follow your rs feed, liked you on facebook 3 different pages. My fave is blueberry pie ( pumpkin is a close second) and I can envision an afghan done in shades of blue and purple, with some buff-colored trim in the edging (pie crust!!). It’s got to be chocolate and I’d be inspired to crochet a warm brown sweater or cowl, with bits of cinnamon and cream too!!! Mmmm. Perfect for the cold! You wouldn’t think I’m in the desert, right? Lol! But I’m looking forward to moving somewhere a lot cooler! Following both you and Lindsey on Pinterest as Fruitful Fusion. Things are a bit slow on my end. Will check out the other bits when I can lol! Joined CSML Rav group! Added Lindsey as a fave designer. I’n Fruitful Fusion on Ravelry too! Pinned here: http://pinterest.com/pin/68609594294683674/ and tweeted! LOL! My favorite pie is mince pie and I’m not sure how I’d interpret it in crochet. I guess a variegated yarn in rich golden browns made up in some type of textured, bobble-like pattern? I follow Poetry in yarn in google reader – not sure how to link to that though. My favorite kind of pie is Cherry. I absolutely love it. I would probably find a pattern that had popcorn or bobble stitches to emulate the cherries and do the pattern in red of course. I think I would make scarf. I follow you and Lindsey on Google +, I follow you on Pinterest and I am on your CSML Ravelry group. I am following 2 of Lindsey’s boards on Pinterest. I also have Lindsey as a favorite designer, and why wouldn’t i . I loved looking at those designs of hers. I pinned this on my crochet 8 board and it came back to this post. I am signed up for you newsletter. I tried the link for her blog above and for some reason I can’t get ton it. I found it by googling it but can’t find how to follow, like the entries that are there. Clicked on the RSS feed but it brought up a mess of code. I would love to follow her blog. Oh and by the way Happy Thanksgiving!!!!!!!!! I did it, I am following her blog, OK I need to put a caveat here. I’ve done all these posts on my Google Nexus tablet and I’m still figuring things out so this is an accomplishment. Woo hoo!!!!!!! I love pecan pie – maybe I could crochet something using the crocodile or puff stitches so it looks bumpy like pecans. I Follow Crochet Concupiscence on G+. I Follow Lindsey on G+. 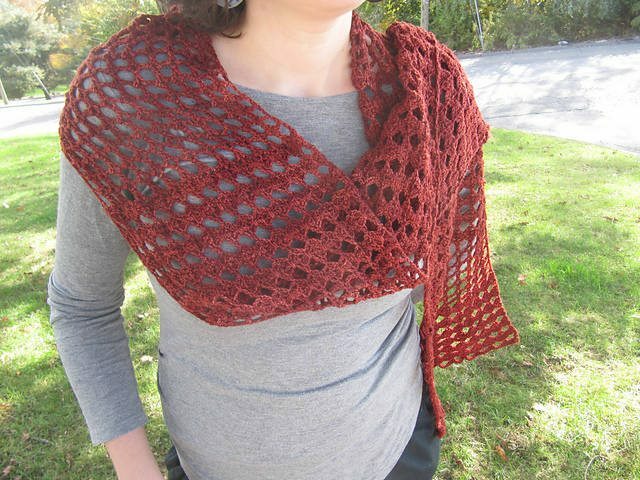 Added Lindsey as a favorite designer on Ravelry (cnuland). And the winner is … Underground Crafter!!! I’ll send an email to you now Marie but just wanted to give you a public congrats. @CrochetBlogger Oh yay! How fun!